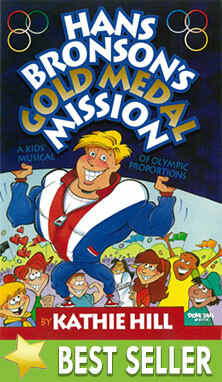 Hans Bronson's Gold Medal Mission : Kathie Hill Music, LLC, Making music with and for kids for over 25 years! From country to rap, Kathie goes the distance in musical styles while presenting the plan of salvation in ways kids of all ages can comprehend. As a guest speaker in Anytown, USA, Olympic contender Hans Bronson experiences a life-changing event with the help of three student reporters. Even though Hans is brawny and strong, he soon realizes that physical fitness is no substitute for the spiritual fitness a growing relationship with Jesus Christ can bring. What a wonderful success we had using "Hans Bronson’s Gold Medal Mission" for our Music Camp. We had 45 children participate, and our church says there has never been a musical like it with such a clear presentation of the Gospel. I had used it In 1996 when the Olympics were in Atlanta. The message and the music are timeless! Kathie’s Note: This may be the most evangelical of all my musicals as it uses the colors in the Olympic symbol to share the plan of salvation with Hans, the kids and the audience. Many a minister of worship has endeared himself to the kid’s choir by portraying Hans, even if their muscles were pure padding! This one is a classic. Up to 100 page download of detailed plans for kick-off, enrollment, rehearsals, auditions, plus musical and spiritual activities for every song. Jewel cased CD with full cover art and complete musical contains the entire Hans Bronson's Gold Medal Mission musical with dialogue and songs. Songs, script, production notes & piano transcription with clean interior & cover. Songs, script, production notes & piano transcription with clean interior. Reinforced spines .